Some of you may know that before I added the store section to the website, my first entry into online sales was actually Swarovski Crystals. 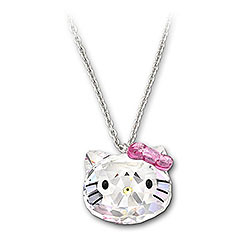 I actually still sell/collect Swarovski Crystal but, I rarely spoke of it here on this blog due to the fact that it's usually not anime related. Being my site is a "shrine" these figures do somewhat fit but now there's been a connection to these seemingly separate businesses.... Swarovski just recently announced a whole new line of crystals that feature a character anime and non-anime fans are familiar with (but we of course know she's from Japan), Hello Kitty. 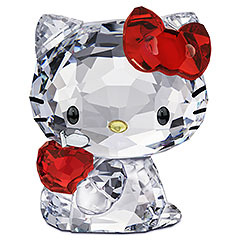 Here's the Hello Kitty section on the Swarovski site. There's necklaces, bracelets and figurines of her ^_^ Granted, they are rather pricy, with one of them as much as $8000 (which looks like they sold out O_O) What I can do is maybe special order these items for anyone interested. There are MAP (Minimum Advertising Price) policies with Swarovski Crystals but if I can, I'll help ease the pain and make them 20-25% off sticker price. In the next week or so, I'll post some in the store for you all to sift through. Anything current on the Swarovski site I should be able to get in usually 2-4 weeks. If possible I'll have a regular stock of these but if anyone is up for any of these for the holiday season coming..email here and we'll help you out.